A fresh crunchy broccoli bacon salad made with bacon, red onions, sunflower seeds and tossed with homemade dressing. It’s a tangy treat for your taste buds! Summer is in full swing and we are doing everything we can to stay cool until Autumn comes to relieve us from the heat. One way to keep your temperature comfortable is eat a cold, fresh salad. For today’s offering, we decided to a share a broccoli bacon salad with a homemade dressing. As always, it’s simple to prepare and delicious to eat. Kim prepared this recipe and we are thrilled with results. The broccoli bacon salad is crisp, crunchy, and combines two of our favorite flavors, savory and sweet. The sunflower seeds and cranberries contrast nicely and the bacon adds a smoky flavor that can’t be beat. I feel, Kim has put together the star of our Summer salad series. We hope you enjoy today’s dish. First, start by prepping your ingredients. I can’t emphasize enough the importance prepping everything in advance. It makes the cooking process so much smoother and cuts down the likelihood of mistakes in the kitchen because your attention never gets diverted. Next, begin making your salad dressing. Start with a medium bowl, and combine the mayonnaise, sour cream, sugar, vinegar, salt & pepper. Set the dressing aside. Now, pour the mayonnaise based salad dressing over the broccoli salad ingredients and stir everything together to coat the salad evenly. Last, serve the broccoli bacon salad immediately or store it in the refrigerator, in a sealed container, for up to 3 days. Pre-cut the bacon slices before cooking to cut down on the overall cook time. When chopping the broccoli (like most vegetables), aim for bite-sized pieces that can be easily picked up with a fork. Raisins can be substituted for the cranberries and pumpkin seeds can be used in place of sunflower seeds. Need another fresh Summer salad? Then check out our Easy Watermelon Salad or our Cold Pasta Salad with Veggies! A fresh crunchy broccoli bacon salad made with bacon, red onions, sunflower seeds and tossed with homemade dressing. It's a tangy treat for your taste buds! First, in a medium bowl, combine the mayonnaise, sour cream, sugar, vinegar, salt & pepper. Set aside. Next, in a separate large bowl, combine the broccoli, bacon, walnuts, sunflower seeds, cranberries, and onion. Then, pour the mayonnaise dressing over the broccoli salad and stir to coat. Last, serve immediately or store in the refrigerator for up to 3 days. The calories listed are an approximation based on the ingredients and a proper portion size. Actual calories will vary. The salad can be stored in a sealed container in your fridge for up to 3-days. I used to make something like this, and haven’t in a while and I was wondering where the recipe was for it! Now I have one thanks or sharing! I’m going to make this and use cranberries AND raisins, and sunflower seeds AND pumpkin seeds! I love the sound of bacon bits in my broccoli salad. This is perfect for the summer. The dressing sounds so refreshing. I can’t wait to try this soon. Prep is SO important and does help in cooking and in cleanup!! This looks delish and healthy for this hot summer! Great side dish recipe!! Oh this salad looks perfect for Summer! 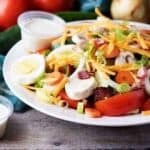 Wonderful recipe of dressing and clicks too. Yasss! Broccoli salad has been a favorite side dish of mine since I was little. Your version looks delicious, I will have to give it a try next time. This is a perfect summer salad! What a great idea to mux broccoli and bacon together! The sunflower seeds really sets this broccoli salad apart. I honestly would eat this for dessert! This broccoli salad looks delicious! I’m loving the two different kinds of nuts – yum! A broccoli bacon salad is always a hit at barbecues and this is solid recipe for making everyone happy. Thanks for the tip about cutting up the bacon before cooking–so much faster. Wow! That is one gorgeous salad. Everything in it sounds so good. Nothing like a good salad for dinner on a hot summer day.